Josee Bienvenu is pleased to present ‘One by One’, an exhibition of ceramics, drawings and watercolors by internationally acclaimed designers Edward Barber and Jay Osgerby. This is their first exhibition with the gallery. The exhibition focuses on a group of ceramics. This new body of work has its roots in experimentation. As Barber and Osgerby were testing clays and glazes a couple of years ago, while developing a collection of tableware, they were struck by the imprecision of the process. Clay reacts unpredictably, particularly when fused with glazes. As much of their work as industrial designers is concerned with control and perfection in manufacture, there is rarely any space for serendipity. This way of working, on the contrary, is erratic, fast, expressive and exciting, the antithesis of, and antidote to, their day-to-day, exacting design practice. These tiles were produced by pouring a liquid slip over the clay in a single motion with a great economy of means. 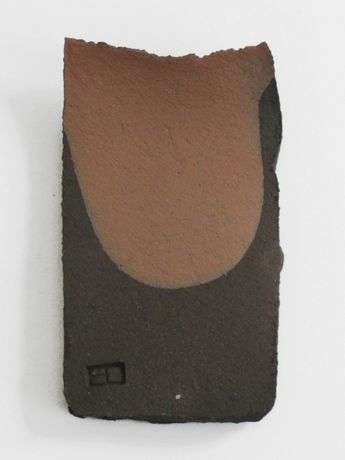 Only natural colors were used: a black or a terracotta bodied clay, with a palette of black, white and terracotta clay slips, to create ceramics with an intense natural quality. As a counterpoint to the ceramics, a series of pencil drawings feature elements of Barber and Osgerby's design work. In isolation, these elevational drawings take on a new abstract quality as they capture the essence of the objects they contributed to shape.